This baked dish is one of my favourites to cook for my vegetarian friends. Spinach is a very important ingredient in Argentine cuisine and this particular pie brings out the essence of the spinach flavour in a very delicious casing! Sift together flour and salt. Rub in butter until mixture resembles coarse crumbs. Add water and teaspoon by teaspoon and mix to a smooth dough (if more water is needed, add gradually). Knead lightly, wrap in greaseproof paper and chill for about 30mins. Take 2/3, roll out and line a 23cm springform tin. Prick well with a fork, chill for 15-20mins. Bake in a hot oven (200 degrees) for 10mins only. For the filling, beat together eggs, milk, nutmeg, salt and pepper to taste, mix in the spinach. Shell the hard boiled eggs. 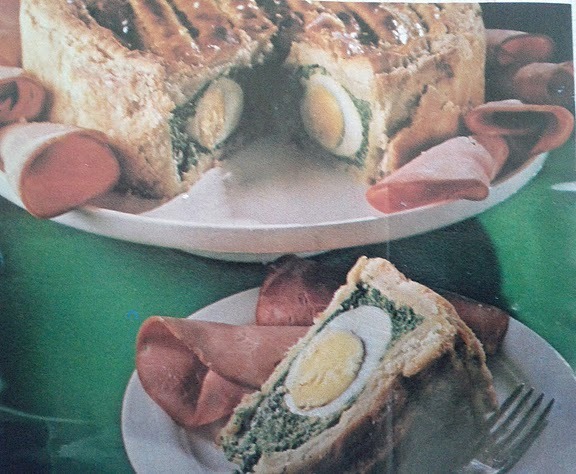 Pour half the filling into the pastry, arrange the eggs around the edge, add the rest of the filling. Roll out the remaining pastry, moisten the edges and put on top of the filling. Press the edges to seal, brush over with beaten egg. Return to the oven and bake for 25-30mins. Once the pastry is golden remove from the oven. Let it cool and remove from the springform tin. Let it cool and then dig in!